A rowan framed Dream Catcher for the strongest Celtic protection - made in our workshops in Avalon, with Rowan berries woven into the design. DREAMCATCHER FAIR TRADE - 1"
- may come with pentagram or simple web - at this price please don't ask for specific colours - these make GREAT presents, and the work too! DREAMCATCHER FAIR TRADE - 2"
may come with pentagram or simple web - at this price please don't ask for specific colours - these make GREAT presents, and the work too! DREAMCATCHER FAIR TRADE - 3"
may come with pentagram or simple web - at this price please don't ask for specific colours - these make GREAT presents, and they work too! 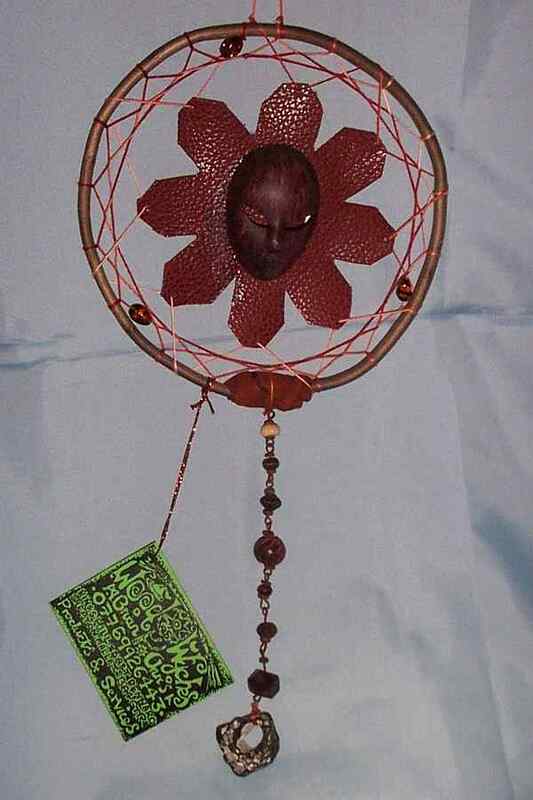 DREAMCATCHER FAIR TRADE - 4"
THESE ARE CURRENTLY NOT AVAILABLE. WE ARE SEEKING ANOTHER MANUFACTURER. THESE FANTASTIC QUALITY LARGE SHIELDS ARE MADE FOR US BY CHRISSIE HERE IN AVALON, FROM LEATHER, THREAD AND A HONEYSUCKLE OR WITHY FRAME, RICHLY PAINTED, AND DECORATED WITH RELEVANT SYMBOLS OF THE ELEMENTS.